Before Project Dumpster Fire broke down this week, I already had a feeling I had a vacuum leak. What I didn’t know is where. I’d heard of using a “smoke machine” to troubleshoot, so I looked into it. Long story short, there are two types of smoke machines: those that cost thousands of dollars and don’t look like they’ll get you on a watch list and those that cost tens of dollars and look like they will. Seems like most DIYers and some shops go with the latter. While looking into if I could convert my fog machine to do this task, I stumbled on the DIY “paint can” smoke machine. Basically, for $50 in supplies you can make a pretty decent smoke generator. 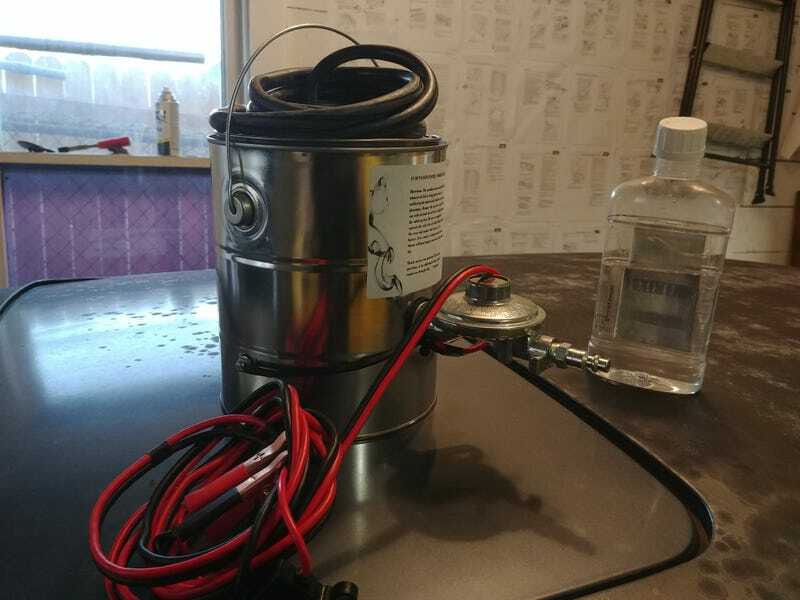 The construction is pretty simple: a container (in this case a paint can), a pressure regulator, resistance, wire, a wick, baby oil, and an outlet. When connected to 12VDC, the resistance wire, which is wrapped around the wick, begins to heat up. The wick, drawing baby oil from the bottom of the container, starts smoking. As the container fills up, the smoke begins to trickle out of the container. When an air compressor is connected, the pressure regulator drops the air down to about 1PSI and a soft jet of smoke is pushed through the outlet. Not enough to blow out any seals, but enough to find leaks. Despite being relatively straight forward, I opted to purchase a pre-built unit for $75, rather than messing with sourcing parts and building the thing. I know myself and I know that the likelihood of me finishing that build is approximately 0. I hooked it up to the Saab and was immediately impressed with the results. Even though I hadn’t plugged the air inlet, the car’s air filter provided enough back pressure to force smoke out of the leaky points. Four of them in total. I guess my instincts are spot on! After a short break, I decided I wanted to keep playing and hooked up the machine to the next victim candidate. George’s 1991 VW Cabriolet (The Bumblebee). Unfortunately, at some point in the last test the wick decided it would much rather be ash, and was no longer... there. I suspect either I didn’t have enough oil, the wick wasn’t long enough, or I need to limit the current a bit. Or all three. Luckily, bulk wick and oil are both cheap so those will be here soon and I can get it up and running. If that doesn’t solve the problem, I’ll go ahead and install a PWM driver on the front end of it for added control. So... what do you want to know about it? Or anything else really. I’ve got time.